1 Shoe Polishing Cloth. This square shoe polishing cloth measures 30 x 30 centimetres is used to apply shoe cream and shoe wax to the shoe. Alternatively, it can be used to polish the shoe. 1 Shoe Wax – colourless. This special shoe wax from Burgol offers perfect moisture protection. It combines the advantages of dubbin and palm wax to form an environmentally friendly waterproofing substance. 1 Waterproofing Agent. This liquid waterproofing agent with sponge applicator penetrates deeply into shoe leather, reinforcing its water-repelling capabilities. As a result, wet feet are a thing of the past. This product is colourless and does not produce spray vapour. Comes in a 75 ml cylindrical stick. 1 Shoe Cleaner – 125 ml. This Burgol shoe cleaner gently removes dirt, salt and perspiration from all kinds of smooth and rough leather surfaces. It also disinfects, regulates pH, and reduces odour. Apply this shoe cleaner to the shaft as well as to the inside of the shoe. 1 Pair Snow Chains. These hardened steel chains are easy to attach to your shoe—simply fasten and tighten the two rubber bands beneath the sole. The snow chains guarantee a firm, sure stance on frozen ground. 1 Pair Lamb’s Wool Insoles. 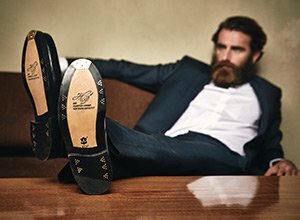 You can now enjoy warm and comfy feet in winter, thanks to these breathable, heat-isolating lambskin insoles. Texon-stiffened undersides keep the insoles from slipping inside your shoes. Purchasing this winter shoe care kit saves you about 25%, as compared to individually purchasing each item contained inside.